Our prices do not include shipping and packaging. This will vary from one customer to the next depending on how and where you want it shipped. 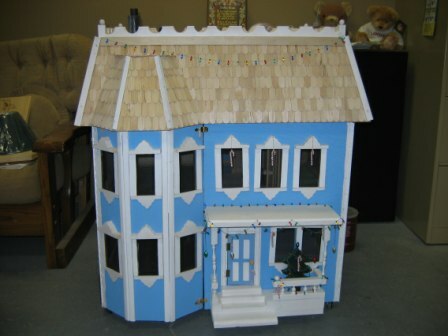 This is one Huge Doll House. It stands approximately 36" tall. The roof comes off for easier shipping and handling. The base of the house is 3/4" plywood and rests on 2 1/2" industrial quality swivel casters. The front of the house is hinged and latched. The windows are trimmed and screened in. All the doors are hinged and functional. The clock in the living room is customized with your child's name and birth date. The roof is covered with approximately 900 individual wooden shingles. The walls are painted and wallpapered. The floors are covered with linoleum and felt carpet.